"14 Facts Of Right Doings"
Welcome to "14 Facts Of Right Doings"
We all can see the turmoil which this world is in, and it's not because of doing things right. It is because of the wrong doings... that's why I created a image for the results of what happens with the wrong doings of people who refuse to repent. The Bible however, gives so many blessings and gifts to those who do right, and obey God's word. But, if we refuse, well you are looking and listening to it on the news everyday. It also, has to do with our leaders in the government to, but if people all around the world would just repent all this would stop. But, there are millions who refuse.... 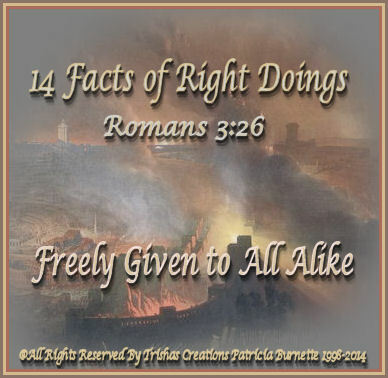 I have listed "14 Facts of Right Doings" which we all can receive and experience if people would just repent. Many of us already are experiencing the goodness and blessings of God, which He promised us in His word. But, there are so many who will never experience it because they refuse to repent of all their sins.